Welcome to SitcomsOnline Digest! The time has arrived, and this week, we got a look at what every major broadcast network plans to do this fall. We have a brief synopsis of a few highlights we saw here today, and you can see all the full lineups by looking at the past few days of our blog entries. Let's get going! Warner Archive is laying out plans for June, and although there are no sitcoms in there, there are some very surprising treats for fans of classic TV, such as the the complete series of the 1980s crime drama McClain's Law and the first season of the 1960s medical drama The Eleventh Hour. Lou Grant - The Complete First Season (DVD, $39.97): One of the most unexpected releases of the year, for sure, is this first season release of the successful (yet rarely seen today) spinoff of The Mary Tyler Moore Show. 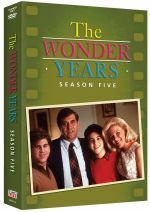 The Wonder Years - Season Five (DVD, $29.95): Though the complete series has been out for some time, this release brings to retailers the final piece of the classic series that many thought would never arrive on DVD. Who to Follow: Matt LeBlanc (Twitter), "Actor, writer, producer, director, singer"
Claim to Fame: In the last half of the 90s and the first half of the 00s, Matt LeBlanc was one of your Friends. Literally. He played the role of Joey Tribbiani in that successful series, and after it ended, he continued to play the same role in a spinoff that was doomed from the beginning. That wasn't exactly his first role, though, as before that he had a couple of guest spots on Just the Ten of Us, and also appeared on Married... with Children, which in turn had a spinoff called Top of the Heap. Oddly enough, that spinoff was canceled after only seven episodes, but it gave birth to yet another continuation which he starred in, called Vinnie & Bobby, also canceled after seven episodes. Obviously, this business of getting roles in failed spinoffs of failed spinoffs worked out for the best, as it wasn't long after all of this nonsense that he was cast in Friends. This fall, he makes a return to comedy on CBS with the series Man with a Plan.